Ug, what a boring name for something I'm so excited about! Last year, we went camping right before school started. I thought I blogged about it, but nope. Well, we went to place called Currant Creek. This was an amazing campground. Just beautiful. Back when my dad worked for the Forest Service as a landscape architect, he designed this campground and the trails around it. It was one of the best campgrounds we've ever camped at. It was fun to walk the trail with my dad and most of the grandkids, particularly, because he had written all the signs along with way. 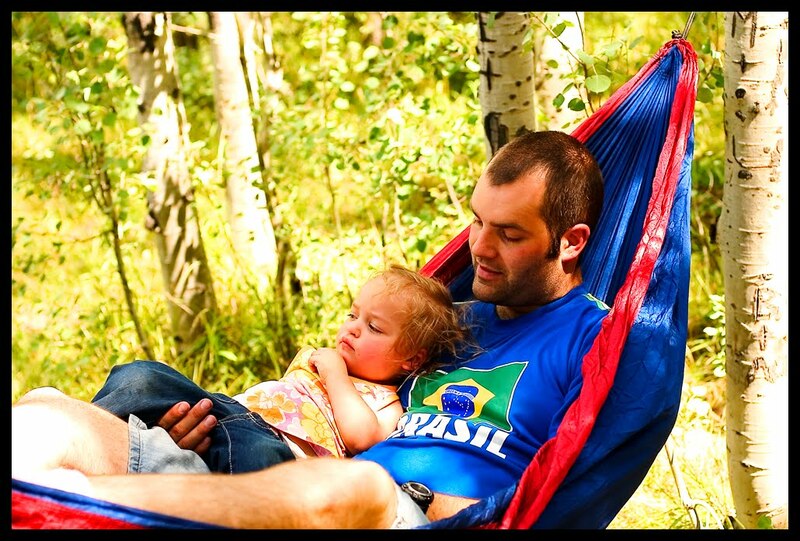 Aubriana and Daddy hanging out in the hammock at Currant Creek. Our site was surrounded by Aspens and firs. Just beautiful! Anyway, it was such a nice trip, only marred by our lack of preparedness. We forgot trash bags. We forgot various cooking items. We forgot our own toilet paper. We forgot firewood. I think we forgot so many things that I've forgotten all we forgot. It was a bit of a mess. Currant Creek is not close to anything, so we couldn't just drive a bit and pick up what we forgot. 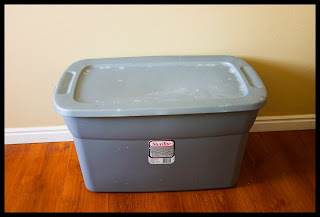 For a long time, I've been meaning to make a box that had a lot of the things you need to camp already packed in it so we could just grab it and go. While we're not likely to forget the tent, we sometimes forget trash bags, matches, stake mallets and the like. I sat down and made a huge list with everything I could think of. 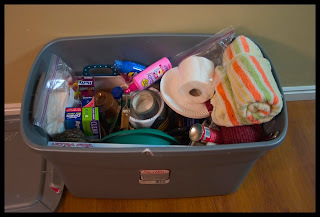 Be aware that this list is just stuff I want to keep in my box all the time, so it doesn't include large things like tents, tarps or camp chairs that are too big to fit in my box or little things like toiletry items we would normally bring along anyway. Print out list. Cross off anything you don't think you'll use and add things I might have forgotten or things that specific to the way you camp. Mark which supplies you already have extras of that can go in the box. Start buying/gathering supplies. I shopped the thrift store and the dollar store for most of my items, and spent about $70, but I still have a few things to get (it would be easy to spend more, so don't hate me if it's more than that, particularly if you want to buy all new). 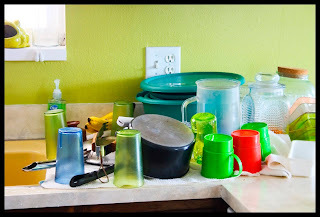 An easier way might be to pick up a few things at a time. Wash any used items. Dry. Group like things together. Find/purchase a large plastic tub to put all your stuff in. As you put things into your box, cross them off your list. 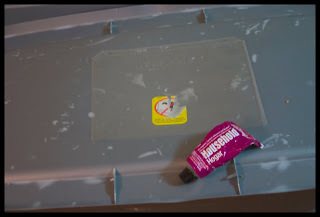 Glue the page protector to the bottom of your lid. Let dry over night. Tuck your list inside for easy reference. Load up and go! You might want to be a bit more organized than I was (I think I gave up and started just tossing things in there, must work on my ability to be organized). Gah, that picture is so boring. Really, it's going to be some awesome to have everything I need to keep our camp running. Maybe what it needs is a rainbow, puppies and a unicorn? That is a great idea! 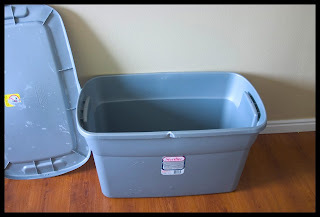 As we have purchased new items (pot and pans, etc) I have saved the old items and put them in the plastic storage containers. All our old stuff has become our camping gear. 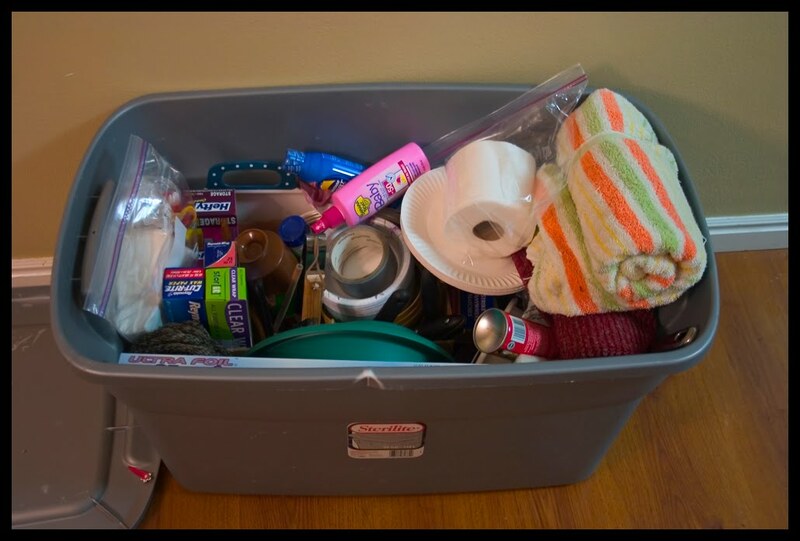 Before camping I bring out the containers, run through the dishwasher, and repack and place in the trailer. 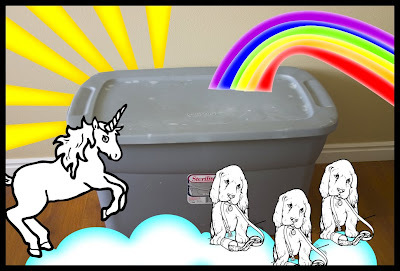 Yes, the rainbow and unicorn and puppy totally did the trick! Thanks for the camping tip. Haha! The picture with the "pretty" things totally cracked me up! 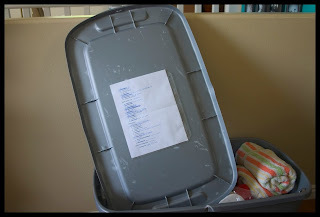 We have the same rubbermaid at our house -- but I didn't have the list taped to the top -- great idea-- thanks! I love to camp and it is always so stressful. I am going to start one this weekend. Thank you so much for sharing and helping the rest of us enjoy camping a little more.